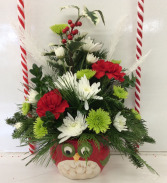 Send this unique ceramic owl filled with fresh winter greens, a silk holly branch, glittery feathers, red carnations and green and white mums. Red Roses Tipped in iridescent glitter arranged with assorted winter greens in a clear glass vase with an iridescent organza ribbon. 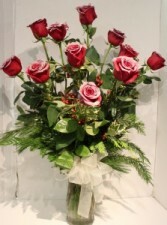 18 or 24 beautiful premium roses for the higher price points! 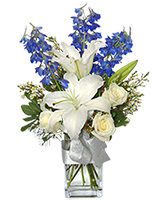 This arrangement has sparkle and class. 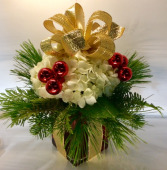 This festive holiday arrangement is a perfect gift of fresh flowers that includes red carnations and white cushion mums in fresh fragrant pine greens. Pine cones and branches top it off for that winter feel. The cylinder vase is covered by a decorative fabric sleeve adorned with a twine ribbon and a wood tag. Really make an impression this holiday! 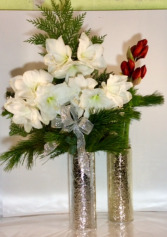 This is a metallic 12" cylinder vase filled with amazing amaryllis and fresh winter greens. Choose between white in a silver vase or red in a gold vase. The higher price has one more stem of amaryllis. 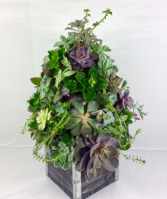 Make a huge impression this year with this long lasting tree made out of a wide variety of fresh succulent blooms. It is in a cool wooden box and stands at 18" tall. This fun arrangement is in a ceramic keepsake container and has carnations and mums. It is trimmed with jingle bell branches and glass balls. It also has fresh winter greens. Send this festive pine cone snowman on a log keepsake this holiday! 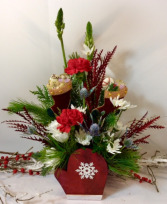 It contains fresh evergreens with red carnations, pine cones , glass balls and glittery branches. 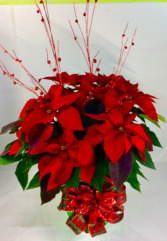 Make it merry with this traditional Christmas poinsettia plant in a 4" pot. It is in a fabric argyle sleeve and adorned with a wooden tag. Buy one for $22.95 or save and get 2 for $39.95 or 3 for $49.95. Nothing is as sweet as this ceramic keepsake lidded candy bowl this Christmas! 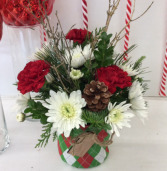 It is filled with fresh evergreens, fuji mums, 2 sizes of carnations, cushion mums and green trick. This is the perfect present because it looks like a present! It is a glass cube filled with fresh evergreens, a lush hydrangea and glass balls. It is decorated with festive, shiny metallic ribbon for that special touch! This is the perfect gift for the holiday! 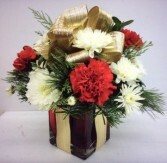 It has red glittered premium roses, a snowy branch, a holly stem and fresh winter greens. 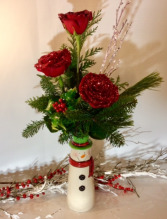 It is in a ceramic snowman bud vase. 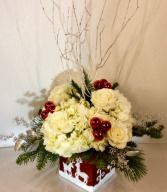 Send this "decked out" centerpiece and bring joy this Christmas! 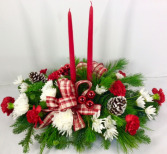 It has 15" taper candles, glittery bows, gold seeded eucalyptus and pine cones all in a bed of fresh pine greens. There are red carnations and white cushion mums for a pop of color. 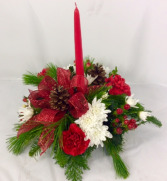 Make it merry with this traditional round centerpiece with a candle. It has fresh pine greens, berries, carnations and white mums. It is topped off with a glittery bow. Send a classic this Christmas! 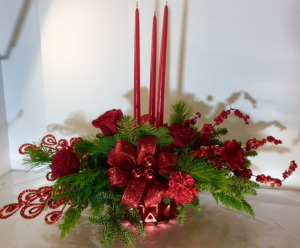 This centerpiece has 15" taper candles, glass balls and frosted pines cones all in a bed of fresh pine greens. It has red carnations and white cushions for a pop of color. Tis the Season! Time to pull out the lights and put up the tree! 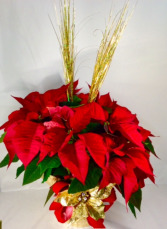 At ACCENT FLORIST, we specialize in all-things Christmas! 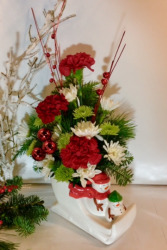 With the trendiest Christmas accessories and ornaments, you are sure to find exactly what you need for your holiday decor at ACCENT FLORIST in Troy. Whether you're planning for a Christmas party or just decorating your home for the holiday, we've got you covered. 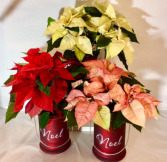 From traditional, to playful and fun, you will find the Christmas decorations you need at ACCENT FLORIST.